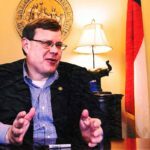 Republican House Speaker Tim Moore presides over a supermajority in the North Carolina General Assembly — and is now engaging in blatant voter suppression to keep it. And it gets even more insidious than that. The legislature, under Moore’s leadership, has also passed measures eliminating a Saturday early-voting day that is hugely popular among black voters, and requiring satelite early-voting sites to remain open for 12 hours during weekdays. That sounds like a win for voters, but is actually so expensive that many counties that previously provided the early voting sites will be required to shutter them in 2018, perversely limiting North Carolinians’ opportunities to vote.